- Went to Midnight Cowboy for drinks. The bar is built in an old brothel, so when you make a res you're actually booking one of the old rooms. Kind of gross and kind of hilarious. Also, they have a very fancy prohibition-style cocktail list and a bar cart that rolls up to the door so you can watch your drink being made. 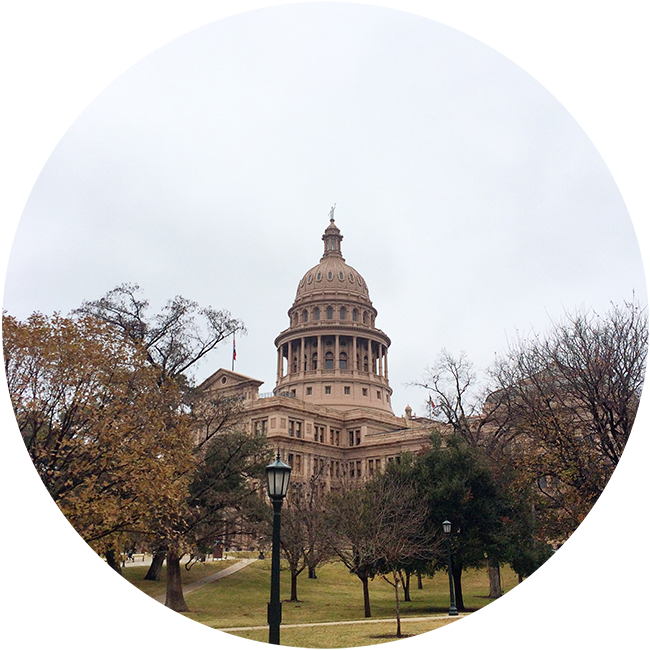 - Wandered down Congress to see the sights and check out some of Austin's famous murals. - Visited a bar thats entrance is hidden behind a sliding bookcase. Seriously, they had me at hidden door. Also, all of the bartenders had very amusing facial hair, so this place was a win for me. - Decided that my new life goal is to become the governor's wife so I can live in this beauty of a house. So, step one, move to Texas, step two, get Jeff to become the governor. Shouldn't be hard. - Rode a jackalope, because, well, why not, and had a freaking amazing burger at The Jackalope. - Went shopping in the boutiques on Second Street and found an amusing mix of designer handbags, Austin souvenirs, and items that are clearly meant for illegal drug usage. - Had brunch at Stubbs, where there was a live gospel show as well as a buffet featuring both eggs and barbecue. I was a very happy girl. - Visited the Texas Capitol building, which is just slightly bigger than the US Capitol because, well, Texas, and full of intricate details like stars on everything and some very fancy door hinges. - Ate and drank and ate and drank and ate and drank some more. Austin, I will definitely be back. Oh and P.S., today I'm being featured on Style Me Weekly! Sounds like you had an amazing time!! I want to visit Austin so badly. If I ever will be there definitely will check those places! Sounds like such a great weekend!! How was the Texas BBQ?!? What a fun weekend get a way! I love Austin such a beautiful city. oh my gee soooooo good!!! You should get there girl, I'd been wanting to go for a long time and am glad I finally made it! Definitely go when it's a little warmer out though - a cab driver said Feb is actually the coldest month. Wow~ that all sounds like so much fun!